I have a quick question regarding qiime2r. I tried to install it on R 3.1 and it said that it is not available for that version, hence, I updated R, but I still get the same message. Do you have any suggestion of what I can do? If not, I could just work by exporting all data as a .tsv file, correct? I’m pinging @jbisanz, the creator of that plugin for his feedback. Thank you, I will wait for his response. With all that said, it does specify that your R version should be 3.5 or greater in the current version which is a bit artificial but what can I say, update your deal. Perfect, I will install them with github. Thanks! Quick question. I do have Rstudio 3.5, and I used the code you mentioned to install the software, but, I still get the same error and in addition, I received this error. Skipping install of ‘qiime2R’ from a github remote, the SHA1 (ba443df0) has not changed since last install. This would actually suggest you have already installed the package. It is saying that it won’t update the package because it is identical to the one that is there. You should be able to load it now with library(qiime2R). I have only the CRAN depository. I used the command as practice but not worked. 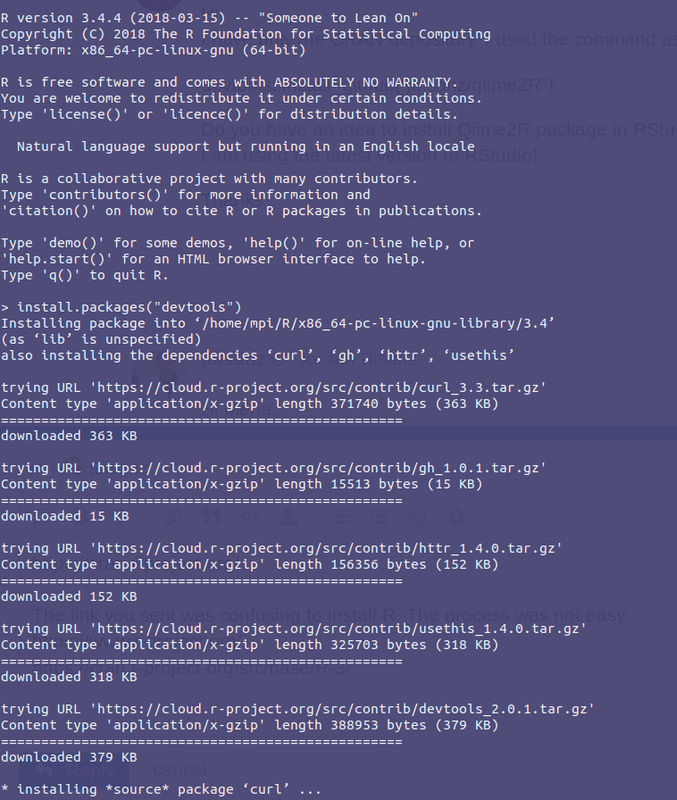 Do you have an idea to install Qiime2R package in RStudio? I am using the latest version of RStudio! (Confusingly) Rstudio is an interface to R and its version is unrelated to your R version. Download the latest version here for your operating system: https://www.r-project.org/. Then make sure you have also installed devtools. If it still does not work, please post the error message when you try to install. The link you sent was confusing to install R. I could not handle it. It appears that devtools is in the middle of installing in your screenshot. I do not see an error raised. The installation of tools that require compilation may not be instantaneous. It appears you have R 3.4.4 which should be supported.